H.H. Arnason, The Sculptures of Houdon, New York, 1975, pp. 72, 115 (note 186), pl. 94. Françoise-Eléonore de Manville (1749-1827) married the Comte Elzéar Joseph de Sabran in 1769. He was fifty years her senior, and died five years later leaving her a young widow with two children. Three years after his death she became the mistress of Stanislas Jean, Marquis de Boufflers (1738-1815). He was a poet, military officer and knight of the order of Malta. A portion of their intimate correspondence was published in Correpondance inédite de la Comtesse de Sabran et du Chevalier de Boufflers, Paris, 1875. During the Revolution, they emigrated to Brandenburg in northern Germany and lived at the Schloss Rheinsberg as guests of their old friend, Prince Heinrich of Prussia, brother of Frederick the Great. In 1797, after Boufflers had renounced his vows as a knight of Malta, he and the Comtesse de Sabran were married. They returned to France in 1880. She was painted by Madame Vigée-Lebrun in 1786, who described the comtesse in her Souvenirs, Paris, 1835-1837, I, p. 215-216. "She was then very pretty; her blue eyes expressed her sensitivity and her kindness. She loved arts and letters, composed charming verse, which she recited marvelously, and all without displaying the slightest pretensions. Her naïve and gay spirit had a completely gracious simplicity which made everyone love her and court her. Yet her great success in the world affected her in no way." 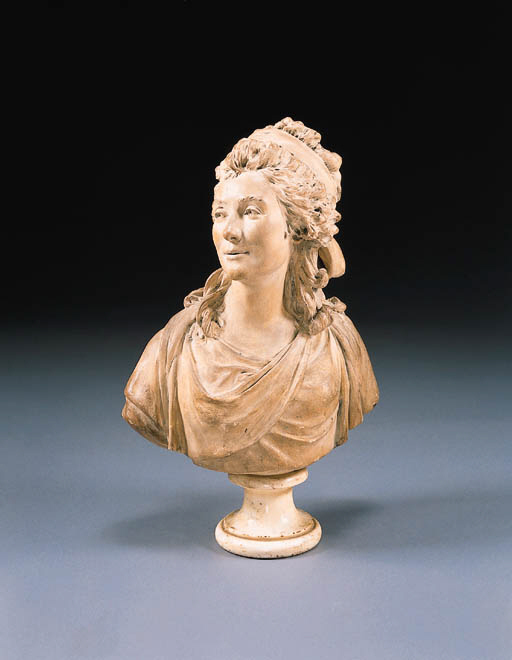 The bust was presumably commissioned by Prince Heinrich who made several visits to Paris in the 1780s and whose own likeness had been sculpted by Houdon in 1784. The prince owned a tinted plaster version of the bust with the red wax cachet d'atelier which is now in the National Gallery, Berlin. Other plasters are in the Thüringer Museum, Eisenach, and the Schlossmuseum, Gotha (Arnason (op.cit).